cycling region. Read more below. One of the great things about living in the Dutch the province of Drenthe is that at any time we can get on our bikes, go out and ride, and make use of the wonderful network of recreational paths which zig-zag across the local countryside. On this blog and on the study tours I mostly concentrate on the cycling infrastructure in the cities and towns because this is what encourages a high rate of everyday cycling and therefore a high cycling modal share. However, recreational paths are also important. They're part of what makes cycling enjoyable and attractive. What's more, these paths join seamlessly with a grid of cycling infrastructure which covers the entire country so they are easily accessible by bike. This makes it safe to begin at home. People are not made to think that safe cycling requires taking their bikes somewhere by car before they can ride them. First some photos from today's short ride. This was no long tour, and it was nothing out of the ordinary for me: A 32 km out and back ride before most people had got up and before I got on with the rest of my day. The Netherlands is of course well known for flowers. This country is the world's biggest exporter of flowers and bulbs, but a huge producer of other agricultural products as well. The Netherlands is the world's second largest agricultural exporter. Of course, this doesn't mean that everywhere is cultivated. Far from it, actually. For instance, this is a large area of heath which I passed through on my ride. The cycle-path here is on no-one's main route and was constructed in a deliberately "rustic" style. Unfortunately, the heavy rain we've had this week resulted in it being a bit mushy so progress was slow for a few kilometres. The surface merely hinders strong cyclists. Sadly, for some people this makes it unaccessible. On the main route back, smooth cycle-path well separated from the road on the other side of those trees. This is part of some people's commuting route which is preserved to a high standard even during works on the path. It was mostly quiet at this time, but other recreational riders were also out and about. Back into the city. Just two kilometres left before I'm home, I've been out to the countryside, returned to the city, interacted with absolutely no cars at all and it's taken less than an hour for this really pleasant experience. Earlier this week, the local paper brought with it a local government publication about Drenthe as a cycling province. Given that the province genuinely has done much for recreational cycling I think it's reasonable to boast a little about it. There are some interesting features in the publication. For instance, a feature about new mountain biking routes (mountain biking is not my sport but I'm hapy to see that there are ever more facilities), a suggestion that more smart lighting is on the way on cycle-paths ("street"lights which come on as you come close to them), and the recently implemented improvements to centre lines on rural cycle-paths to make them more visible in the dark. I also read that Drenthe is soon to have the world's first "biobased" cycle-path. I always welcome such experimentation, but of course we must be make sure that if it results in a change in policy this is genuinely for the better. I've noted before that while cycle-paths cause far less environmental harm than roads, there is a tendency for lower quality solutions which would never be proposed for roads to be proposed for cycle infrastructure with environmental reasons being used as a false, or at least misleading, justification. If there is a big win here there is more to gain by using the new surface on roads than on cycle-paths. There are also some interesting figures. Unsurprisingly for this nation's least densely populated province, people who live in Drenthe cycle longer distances on average than those from other parts of the Netherlands. What may surprise some readers is that despite the longer distances, cycling is slightly more popular in Drenthe than in most Dutch provinces. The average Drent rides a bike on three days out of every four and 44% of short journeys are made by bike in Drenthe vs. 38% of short journeys nationally (for all journeys the figures are 29% vs. 27%). The reason why ? Well, just maybe it has something to do with the particularly attractive cycling conditions in this province: Drenthe has more cycle-paths completely separated from the road than any other province. 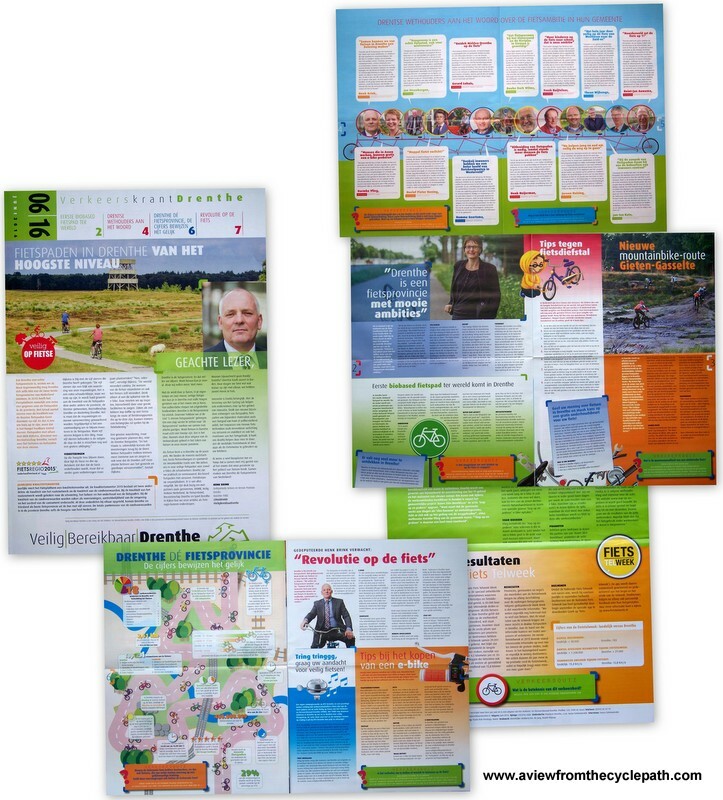 Perhaps the most disappointing part of the publication is where a representative from each council area within Drenthe makes their promise for the future: Most of the council representatives talk about improving infrastructure, encouraging even more schoolchildren to cycle, improving conditions for both young and old cyclists, or making cycling safer in the dark or during bad weather. Unfortunately, Assen's contribution in this section is weak: At the same time as the FlorijnAs project in causes more problems for cyclists than it solves, all cyclists are being offered at the moment is a scheme to encourage adult commuters to try an electric bike. Quite apart from why electric bikes should be singled out as the only type of bicycle which the council seeks to promote, when most people are better served by bicycles without motors, such promotional ideas have been tried again and again over the last few decades in many countries and the result has always been the same: Promotion and encouragement will always fail to increase cycling modal share unless accompanied by improvements in cycling infrastructure. Assen is lucky enough to already have cycling infrastructure which is at a standard somewhat above average for the Netherlands, but there is no point at which is "good enough" and at which development can stop. Encouraging more cycling requires the infrastructure to continue to improve, and certainly not for it to be eroded by the current wave of relatively car-centric development which is causing problems across the country at the moment. We organised our first cycling infrastructure study tour in August 2006. The tenth anniversary tour will take place in September this year. Exact plans have not yet been finalized, but we are planning a change to the way we organise the tours which will make this tenth anniversary tour different to those which have gone before. Book now to find out what works and what does not work for cyclists in the Netherlands, with no hype. We also organise cycling holidays. Ride the most pleasant routes through Dutch nature !